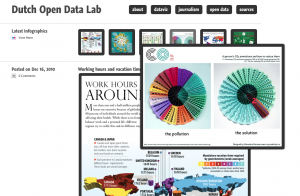 It may sound like some obscure location where the US military conducts experiments but the DoD Lab actually is a very interesting Dutch website about open data, visualization, and journalism. It offers a extensive list of links to Dutch and international data sources and showcases some nice examples of Dutch infographics you won’t find on other English blogs. But international work is featured as well, like this interactive by The New York Times that puts the spotlight on some products that really come out of the Lab of that other DoD: the Department of Defense.